Awwww. Don Berwick is unhappy. In a speech at the annual conference of the Institute for Healthcare Improvement excerpted at the Boston Globe's White Coat Notes blog, the man whom Congress would not confirm as Centers for Medicare & Medicaid Services (CMS) administrator seventeen months after President Obama gave him a recess appointment lashed out at his critics, especially their use of the terms "rationing" and "death panels," describing the employment of the latter term as "beyond cruelty." When the President responded that he couldn't afford to "Play political games with the Senate," something he himself did by using the recess appointment, Todd didn't call him on it, choosing instead to ask, once again, if Washington was "broken?" Todd also could've highlighted the President's personal hypocrisy on this issue -- a point even the liberal Washington Post columnist Ruth Marcus caught -- as in 2005, when George W. Bush recess appointed John Bolton to UN ambassador, a then Senator Obama claimed: "To some degree, he's damaged goods." NBC's Nightly News with Brian Williams on Thursday became the first evening news broadcast to cover the recess appointment of Donald Berwick to run Medicare. 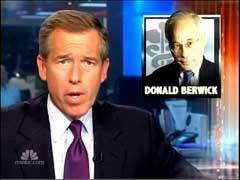 Anchor Brian Williams asserted that "Republicans are angry, claiming it's antagonistic." He also observed, "Berwick has spoken about the need to ration medical care to control costs." NBC has offered the most reporting on Berwick: 20 seconds during the Today show on Wednesday and 35 seconds on Nightly News. Those 55 seconds are still more than ABC and CBS's morning and evening news programs. Their total remains at zero. President Obama’s recess appointment of Dr. Donald Berwick – a controversial advocate of socialized medicine and of government rationing of health care, particularly for the elderly – as head of the Medicare and Medicaid programs has so far received no attention on ABC’s World News or on the CBS Evening News, while the NBC Nightly News on Thursday devoted just 38 seconds to the President’s controversial move that circumvents a possibly bruising Senate confirmation hearing, barely touching on the nature of Berwick’s beliefs and their possible implications for the elderly. Broadcast network morning newscasts have similarly shown little to no interest in the subject. CNN’s The Situation Room devoted a full story to the appointment on Wednesday, but did little better than NBC in informing viewers of the significance of Berwick’s beliefs. 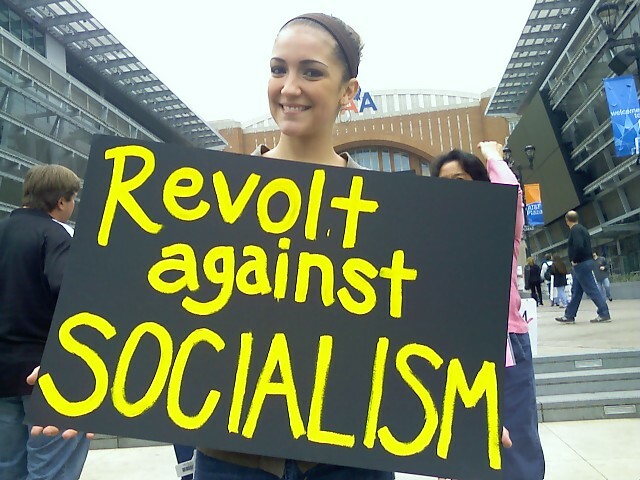 By contrast, FNC’s Special Report with Bret Baier on Wednesday relayed to viewers that Berwick has not only advocated the type of socialized medicine that currently limits access to health care in Britain – favoring a non-free market system based on wealth redistribution – but he has also spoken in favor of government limiting access to some health care procedures for the elderly in favor of younger patients. The GOP as the party of obstructionism: it's a tried and true media meme, but very often falls a tad short of the truth. Yet on occasion, even stubborn facts are not enough to dispel such accusations. 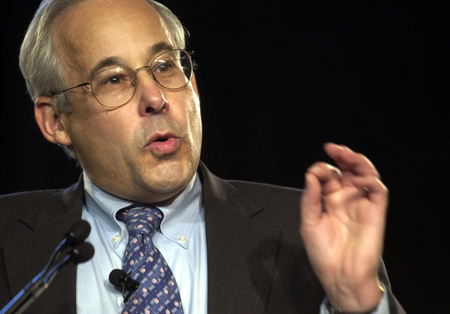 Some in the media have taken President Obama's recess appointment of Donald Berwick to the head of the Centers for Medicare and Medicaid Services as an occasion to bash purportedly obstructionist congressional Republicans. Just one problem: the GOP didn't hold up the nomination. In fact, Sen. Chuck Grassley, R-Iowa, ranking Republican on the Senate Finance Committee, which would have had jurisdiction over Berwick's appointment, said he "requested that a hearing take place two weeks ago, before this recess." Presumably, Grassley wanted to shine light on some of Berwick's more controversial positions, such as support for the rationing of care and his advocacy of the use of the health care system to redistribute wealth. Over the span of two days, the network morning shows have given just 20 seconds of coverage to the recess appointment of Donald Berwick, a pro-rationing doctor who will run Medicare. In contrast, Good Morning America, Today and Early Show devoted 52 minutes of coverage to every detail of Lindsay Lohan's sentencing. 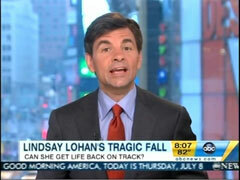 On Wednesday and Thursday's GMA, ABC hosts discussed Lohan for 14 minutes. CBS's Early Show managed 12 minutes to the important topic. Both programs had no mention of Berwick, who once told an audience in Great Britain, "Please, don't put your faith in market forces." Last night the White House announced a recess appointment for a man who's gone on record praising Britain's one-size-fits-all single-payer National Health Service to head up the Centers for Medicare and Medicaid Services. Covering the development, Time magazine's Adam Sorensen cast the appointment of Dr. Donald Berwick (pictured at right) as a blow to "hyperbolic" Republicans who hoped to make political hay out of the Harvard professor's confirmation hearings, yet Sorensen failed to carry any criticism of the Obama administration for the "unusual" maneuver or to examine how the move might bode poorly for Democrats given the public's concerns over the impact of ObamaCare on the health-care system.